To coincide with gifting and entertaining during the holiday season, Blue Circle Foods recently rolled out a new smoked salmon product in the United States. The Washington, D.C., U.S.A.-based sustainable seafood supplier to retailers and foodservice operators launched a new Changing Seas Peppered Smoked Salmon in Whole Foods Market stores. Blue Circle’s Changing Seas line of Norwegian smoked salmon is exclusive to Austin, Texas-based Whole Foods, while its Blue Circle Norwegian Arctic Smoked Salmon is sold via Amazon and select retailers. The Peppered Smoked Salmon, which is rated by Ocean Wise and Monterey Bay Aquarium’s Seafood Watch program, is topped with a mildly spicy blend of pepper and garlic. The salmon retails for a suggested USD 6.99 (EUR 6.14) per 4-ounce package. While Blue Circle’s Changing Seas Peppered Hot Smoked Salmon is a popular choice among shoppers, the supplier “wanted to provide consumers more variety when shopping for our Cold Smoked Salmon,” Pilat said. 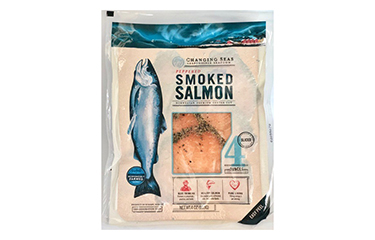 The Changing Seas line includes Cold Smoked and Hot Smoked Salmon, in plain and peppered SKUs. Earlier this year, Blue Circle expanded from the United States to Europe with fresh, frozen, and value-added seafood. It set up a sales office in Denmark to first target the retail market in Europe. Then, it will move into foodservice with fresh, frozen, and value-added offerings, according to Pilat.